Happy Birthday Mary Ann! What a festive soup you have shared. Have a magical time and a very Merry Christmas to you and yours!!! Happy Happy Birthday!!! I hope you are having the best time in Disney World!!! yaaay!! Merry christmas to you and your family! Happy Birthday and Merry Christmas to you and your family! Happy Birthday Mare. I KNOW you and fam are having a fabulous time with Mickey and Friends. Happy Birthday. My daughter's birthday is the 25th but she didn't get this great soup. In all fairness, she asked for chicken soup and she got it with lots of pieces of chicken, floating around. I love tomatoes. Can't imagine them not being liked. I am the lucky one. I can make your soup. It looks like a treat. I think it will stand up to chocolate cupcakes. I had better print it now so I can make it. Happy Birthday to your hubby also and enjoy your trip. What a fun time of year for your family! Happy Belated, Merry Christmas! And the soup looks and sounds de-lish to me! Good for you! A lovely soup. I amazed at the number of people who don't like tomatoes. Thank heaven everyone in my family likes them. I bet Disney was a zoo this time of year...I did it once at Christmas, but never again. That looks really good. Tomato soup is one of the few Brianna will eat. I hope you had a fabulous birthday at Disney! Happy belated birthday!! Hope Disney was fun! Happy birthday, Mary Ann! That soup looks delicious, in spite of being so good for you. I hope you're enjoying your vacation! Happy belated birthday to you and your hubby! 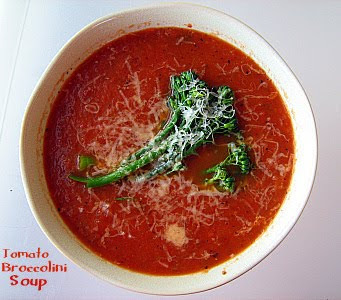 Love the soup - healthy and colorful. Oh yum! 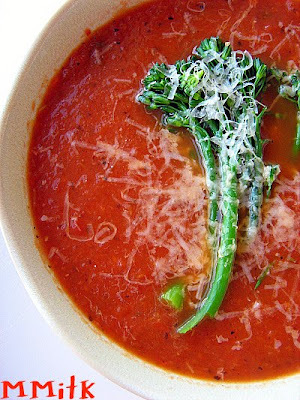 Love tomato soup and broccolini, what a great combination! Happy belated birthday to you!! So happy you got to spend it at Disney! Happy belated birthday! Your soup looks absolutely gorgeous!